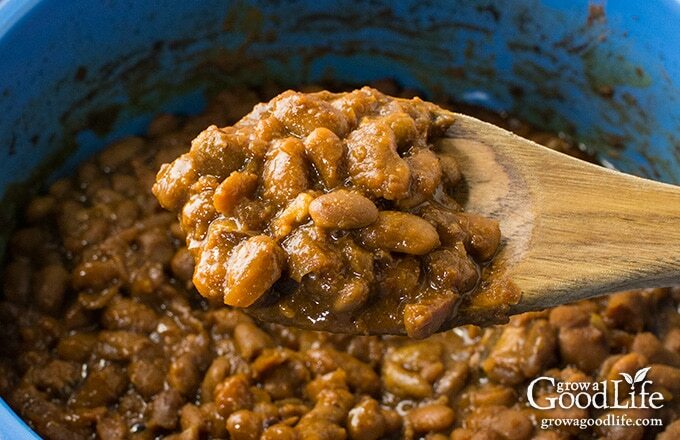 With a few simple ingredients and time, you can make a delicious, slow cooked New England baked beans dinner. 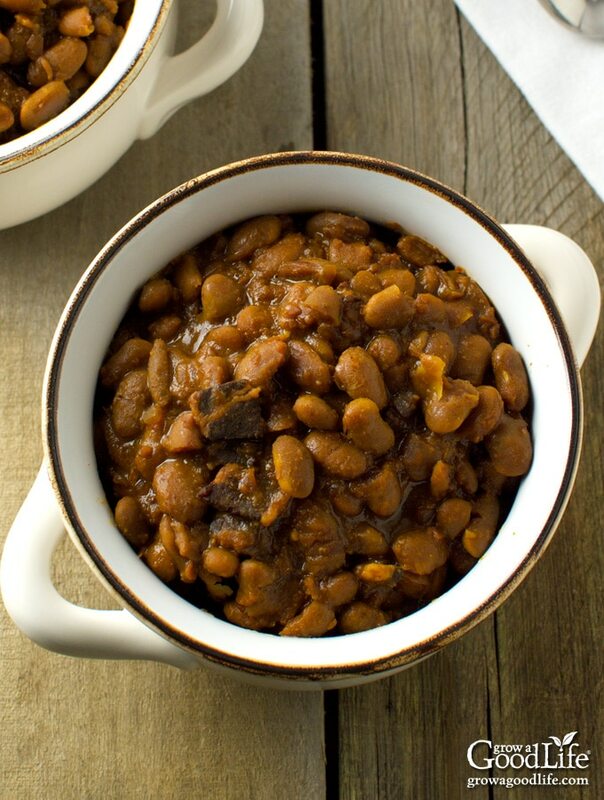 Skip the can and simmer your own homemade baked beans in your crock pot or slow cooker. Just about every culture has their version of a baked bean dish. The Native Americans taught the early settlers how to bake beans in clay pots in the ground. They cooked the beans with maple syrup and pieces of venison or bear meat to add flavor. 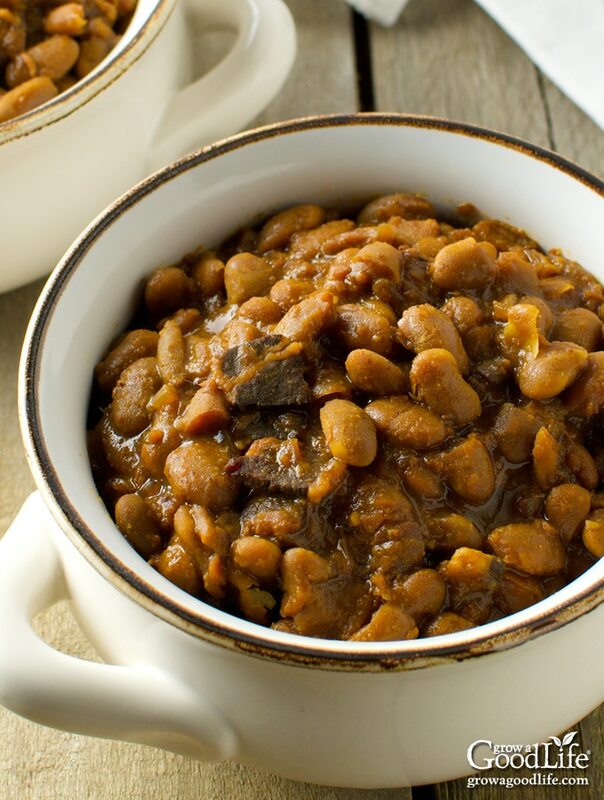 The custom of serving baked beans for Saturday dinner originates from Puritan times. Preparation for baked beans dinners began on Friday by sorting and soaking the beans. On Saturday, the beans and ingredients were added to a bean pot and placed inside the oven to cook all day. Baked beans were served for Saturday’s supper and again on Sunday while the family observed the Sabbath. Logging camps relied on baked beans as a nutritious dense, inexpensive food to feed their workers who labored deep in the woods for months at a time. The cooks would prepare the baked beans in a cast iron Dutch oven and bake them in bean hole in the ground just like the Native Americans did. Today baked beans are still served at church suppers, potluck dinners, family gatherings, and fundraisers. There are many variations of baked beans throughout different areas and even among members of the same family. Almost every family has a recipe with a secret ingredient or two. Here in New England, molasses and maple syrup are common sweeteners used in making baked beans. In the 18th century, New England was one of the largest rum producers in the world. The rum was created from imported molasses, a byproduct of making sugar cane. Molasses was less expensive than sugar, and the sweet syrup found its way in many foods of New England, including baked beans. Common supermarket types of beans that are perfect for baked beans are great northern and white navy pea beans. 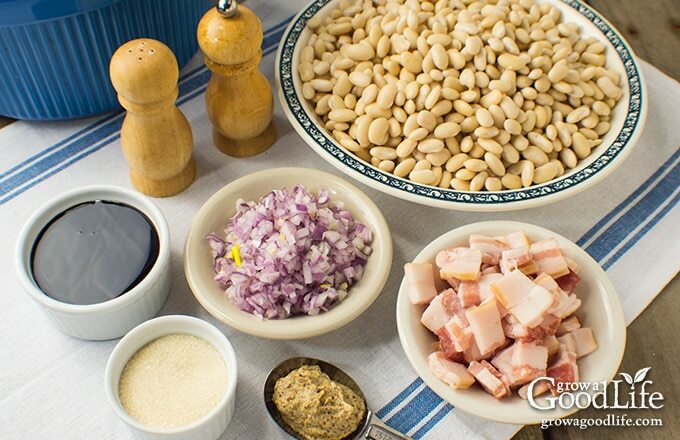 These beans are bland and absorb the delicious flavors of the molasses, salt pork, and other seasonings. 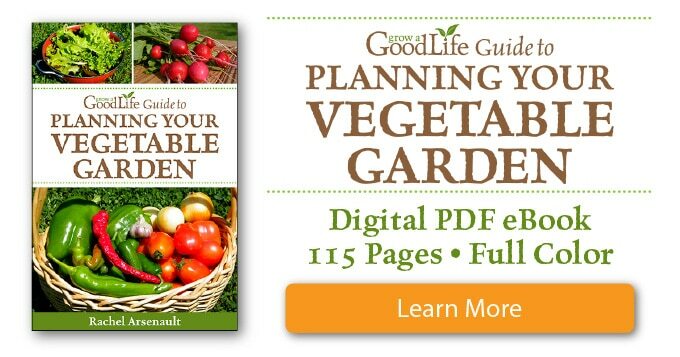 There are also numerous locally grown varieties that are favorites, including Great Northern, Jacob’s Cattle, Marafax, Soldier, and Yellow-Eye beans. Every type of bean as a unique size, flavor, and texture. Some beans require a longer cooking time depending on the type of bean and if they have been on the shelf for a while. The key is to allow plenty of time to cook the baked beans until they are caramelized and sweet. Sometimes, I cook baked beans during the weekend to reheat for a mid-week meal. That way I don’t have to worry if they will be finished by dinnertime. Cook the beans until they are tender, then cook a few hours more and the sauce will transform to a dark brown, thick, and sweet flavor. Sort through the dry beans and pick out stones or damaged beans. Rinse the beans well and place them in the slow cooker crock. 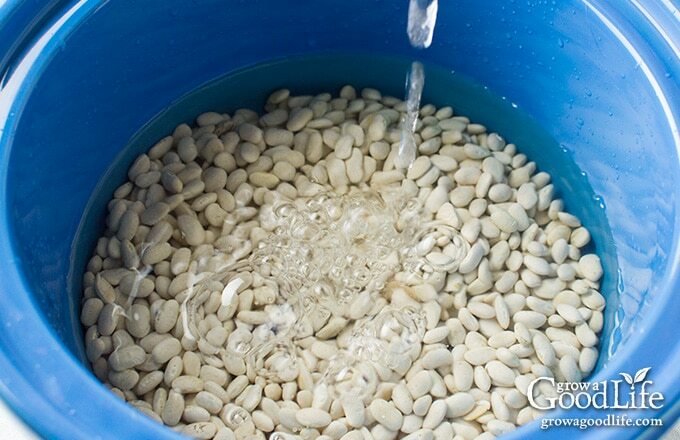 Add enough water to cover the dried beans about 2-inches, about 6 cups of water. Cover and soak the beans overnight. The following morning, drain the beans and rinse well. Combine all the ingredients and about 4 cups of fresh water in a slow cooker. Cover and cook on low for 8-12 hours. 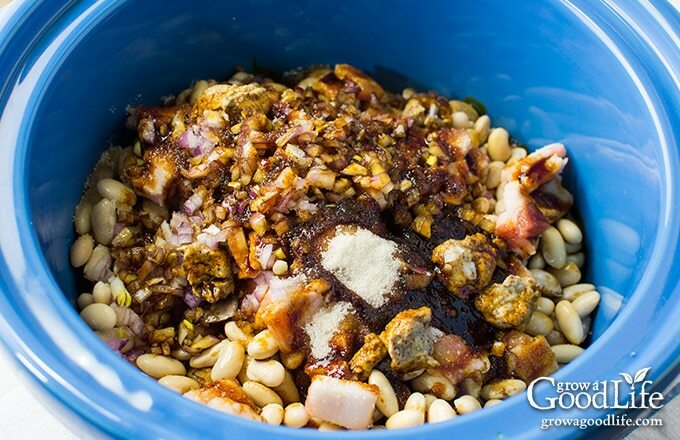 Begin checking at 8 hours, stir, and continue cooking until the baked beans are tender and the sauce forms a caramelized, rich, and thick stew. 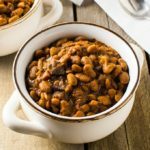 Skip the can and simmer your own homemade New England baked beans in your crock pot or slow cooker. With a few simple ingredients and time, you can make a delicious, slow cooked New England baked beans dinner. 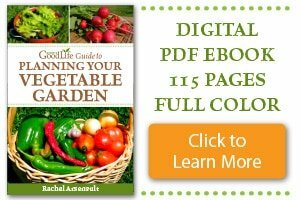 Sort through the dry beans and pick out stones or damaged beans. Rinse the beans well and place them in the slow cooker crock. Add enough water to cover the dried beans about 2-inches, about 6 cups. Cover and soak the beans overnight. The following morning, drain the beans and rinse well. Combine all the ingredients and 4 cups of water in a slow cooker. Cover and cook on low for 8-12 hours. Begin checking the beans at 8 hours, stir, and continue cooking until the baked beans are tender and the sauce forms a caramelized, rich, and thick stew. Makes 8-10 servings. My kids go crazy for homemade baked beans! I’ll have to give these a try. 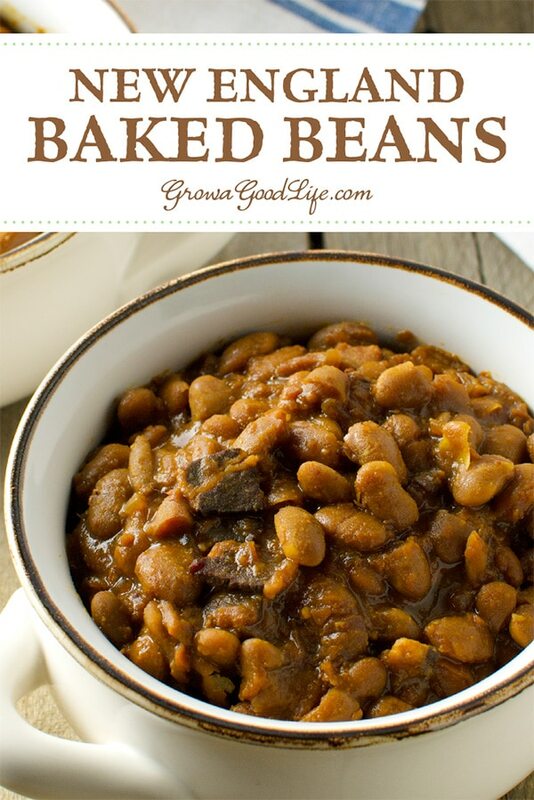 I love homemade baked beans, these look so hearty and comforting!